Williams Demolition Man is an action-packed pinball machine based on the Warner Bros. sci-fi action movie Demolition Man starring Sylvester Stallone, Wesley Snipes and Sandra Bullock. The machine uses unique upright gun handles with triggers and buttons that allow the player to control the flippers, change options, and launch the ball. A player-controlled magnetic claw picks up the ball and drops it into one of five ramps or wire-forms to start a game mode. Demolition Man is one of Williams SuperPin series, which also includes Indiana Jones, Judge Dredd, and Twilight Zone. These wide body games have an extra wide playfield that allows for more features and toys. Demolition Man has three flippers, three ramps, two Matchbox cars, a custom captive ball, and four multi-ball modes. The multi-ball modes include: Fortress, Museum, Wasteland, and Cryo-Prison. 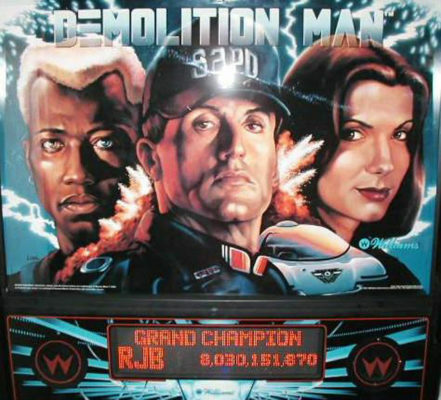 Demolition Man is a four-player pinball machine with digital sound and music and a dot-matrix display. 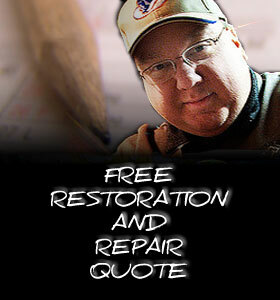 Please call or e-mail us for more pictures or with questions.